Whether you call it soccer or football, very soon fans the world over from Australia to Uruguay and Slovenia to Japan will be glued to the World Cup and Babyology has it covered. Now don’t expect a wrap up on teams, the draw or the games to watch (although the Socceroos’ first game versus Germany should be exciting) – instead, we’ve got some stylish suggestions to kit out little fans. Start big and bring the excitement of the soccer stadium into the kids room with a sensational wall mural by Rooms You Love. The players’ uniforms have been left white so that kids can colour them to match their own team. If a mural is not statement enough, there are also soccer ball print loose covers for chairs, mirrors and light switch plates. A bright green soccer pitch floor rug also makes a great addition to boys rooms. The one shown below is available through Amazon UK and is fun without being over-the-top. 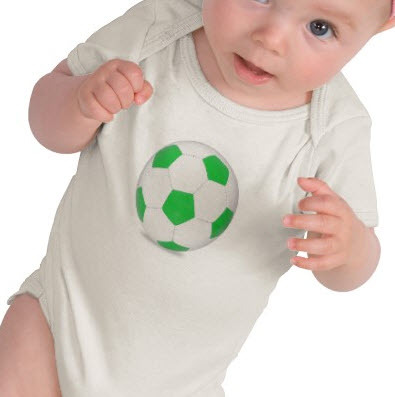 Babies and kids who want to look the part are spoilt for choice – there is no shortage of official (and unofficial) World Cup merchandise available but we like the simple soccer ball onesies and tees by Byron Tiff at Zazzle (shown at top). 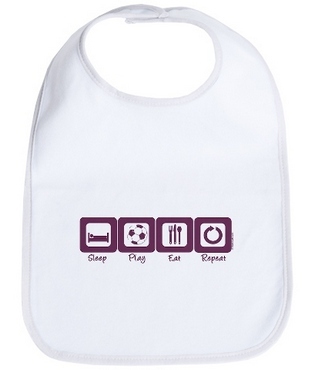 For those families that will be taking up residence on the couch to catch all the World Cup action on television, a ‘team’ set of the ‘Sleep-Play-Eat-Repeat’ tees may be in order. The bib is shown below but there is also onesies, tank tops and short and long sleeved tees in all sizes (including adult) available from Cafe Press Australia. While the kids will probably want to be outside playing the real thing, a game of soccer can be held indoors – without it taking over the hallway. ‘Blow Football’ is a traditional children’s game played with straws and a light ball, the object being to blow through the straws to push the ball around the ‘pitch’. 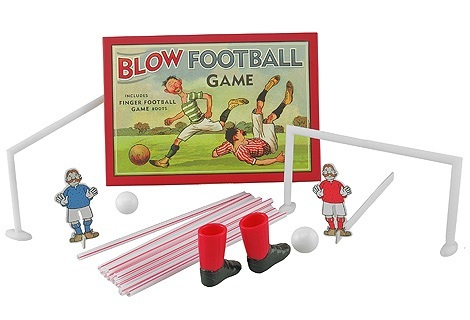 You can make your own game of blow football or you can buy sets – I like this vintage-styled set from Past Times. 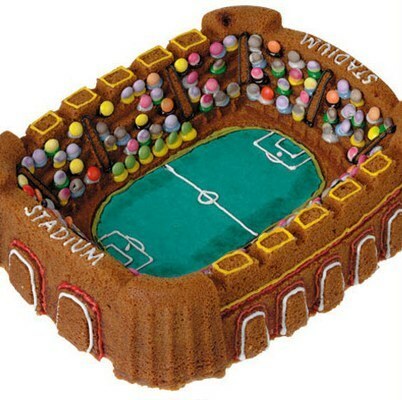 If you are hosting a World Cup party, a stadium cake tin is essential (and a definite crowd pleaser)! This incredible 3D cake tin is available from the UK’s The Great Little Trading Company. Game on!